10:55: Ackles asked Christian Keyes (Michael) what he did to get into the character of Michael. 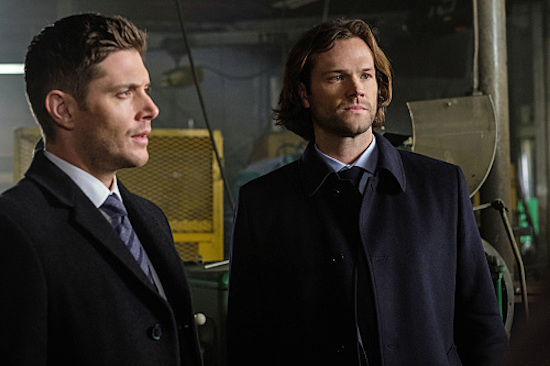 “I actually pulled him aside during the last episode, and I was like is there anything you keep in mind…before you go on camera,” Ackles recalled. Keyes showed him that he dramatically whipped back his coat. “Michael is not a funny character,” executive producer Andrew Dabb said of the differences between Dean and Michael’s dialogue. 11:02: “I’m not going to even try and play it cool; this is awesome,” Calvert said of being at his first Comic-Con. Apparently, Padalecki jokingly kicks Calvert in the crotch during filming. “Jack is going through a lot of struggles right now, so knowing I may be kicked in the crotch at any time really helps with the loss and struggle,” Calvert said. 11:06: Ackles and Padalecki joke how great it was that the writers found a way to keep Jack around sans powers. Benedict fakes heartbreak in reaction. 11:07: “Working with Misha Collins is almost as bad as working with Jared and Jensen,” Calvert said. 11:09: Collins is handing out voter registration forms. He’s encouraging people to register to vote. 11:11: “You try to bring back the favorites,” Dabb said. “Even the Almighty gets no respect,” Benedict jokes. Jodi will be back. There will also be “other members of the Wayward family” as well, Dabb said. Rowena will also be back. 11:13: “Andrew has a plan and he hasn’t let me in on it,” Singer said of episode 300. Singer will be directing the episode. Padalecki said Ackles wants episode 300 to be called “300” and they would be wearing togas. “Clip show! I said clip show!” Ackles retorted. 11:14: Ackles apparently has very specific wardrobe requests when Dean wears abnormal outfits. 11:17: “We have to push ourselves to the brink to find new ways to explore these guys,” Eugenie Ross-Leming said. Dabb credited the cast’s ability to do everything thrown at them. Singer noted they still “slow roll their plot over a season” unlike other shows which speed through storylines. 11:25: “I’ve learned to take things more slow,” Padalecki said of what he learned from being on the show. “When they yell ‘cut,’ there’s gonna be a dust cloud,” Ackles said of how he plans to steal Baby when the show wraps. 11:28: What sci-fi monster would they want to go up against? “I’d say Donald Trump,” Collins said. “Misha, that’s even too scary for us,” Singer retorted. 11:29: Gag reel time, which means end of the panel.